Jill is interested in ancient sites; she once got me to visit Avebury to look at the stone circle there. On a bleak day this place didn’t seem thrilling, even though we stood on ground once hallowed by our ancestors. Avebury, Stone Henge and Stanton Drew in the West Country are as old as some of the earliest monuments Worldwide. Archaeologists and historians can only conjecture as to the nature and purpose of these remains and what went on 5,500 years ago. It is suggested that Avebury was a temple devoted to an Earth goddess. Gods and Goddesses aside – I like to do yoga in these places, weather permitting. In the Mendips you can find a pseudo, mini-stone circle which has obviously been established during the modern era. Though nowhere near as significant as the rocks to be found elsewhere, this small tribute to nascent spirituality makes you wonder about the power of magic circles, ancient customs, Druids etc. During mid-Summer I asked permission to enter the circle and performed Sirsasana (the headstand) at it’s centre before proceeding to meditate for 30 minutes; I left uttering thanks as I did so. 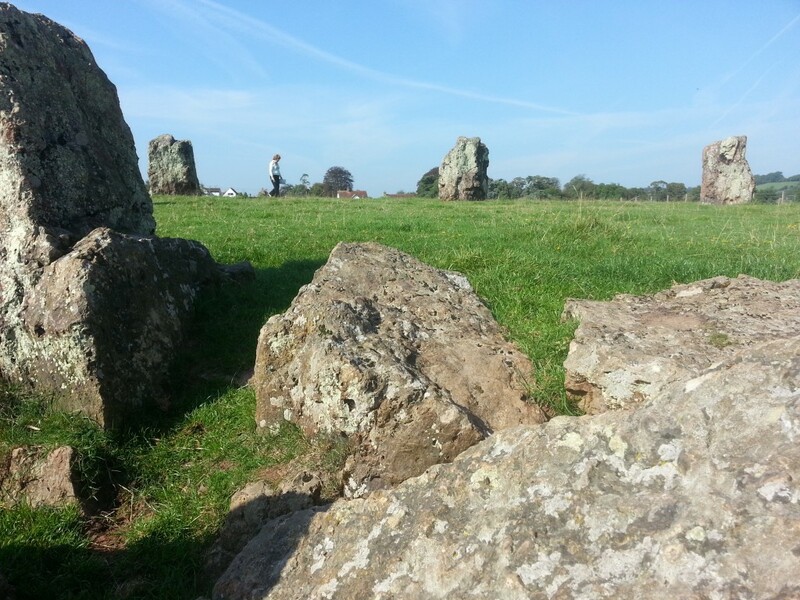 This prompted me to go and look at Britain’s third largest stone circle – the neolithic monument at Stanton Drew. 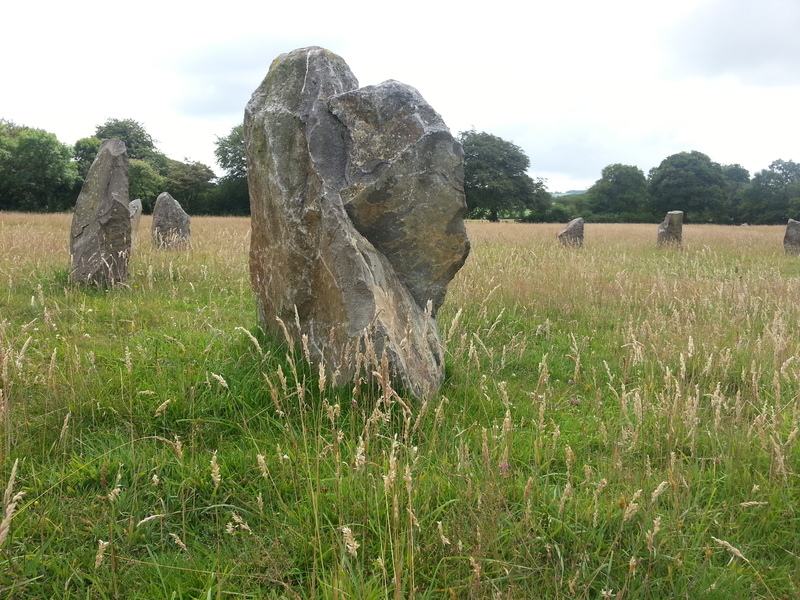 The stone circles at Stanton Drew, Somerset. The stones at Stanton Drew are mighty natural markers which delineate what was thought to be a temple. Again I sought permission and did Sirsasana at the centre of the Great Circle. Though little is known about the history of the place, drawings in the few books published about Stanton Drew, suggest a vortex of energy at the centre of the Great Circle. Adorned with lazy Frisians, the site didn’t repel my whimsical urge to perform yoga there. I ignored the risk of a stampede, getting cow’s poo on my head and upbraiding the nerds with maps; ensuring my cranium was in contact with terra firma I moved into the asana, knowing there must be a psychic force at work if the Sahasrara chakra is brought into alignment with the echo of past energies there. Close up of one of the stones. What struck me was the character of the stones. These monoliths have remarkably pitted and cratered surfaces. Covered with lichen and other natural detritus they are colourful. At one point in history, the stones at Stanton Drew began to emanate light which spiralled into a pillar of energy, reaching up into the heavens with the intensity of a lightning storm. Idle bovine mastication along with birdsong is the backdrop of sound to this place now – making the yoga headstand an unusual experience.The silent stones tell nothing about the past as they sink slowly into the verdant countryside. Against the cobalt of a Battle of Britain sky, faces within them peer out keeping watch over a sacred place.